or, Why Smash the State When Your Local Neighborhood Theme-Park is So Much Closer? “What are the steps in the creation of a Disney attraction? According to literature sent out by WDW [Walt Disney World], the steps are: storyboard, script, concept, show models, sculpture, show set design, graphics, interiors, architectural design, molds and casting, wardrobe and figure finishing, electronic and mechanical design and manufacture, show sets and prop construction, animation, audio, special effects and lighting, and engineering. The French “stop publicity” campaigns in the fall of 2003 would have been unimaginable without a previous event: the cancellation of the Avignon summer theater festival under the pressure of strikes by part-time performing-arts and audiovisual workers. This movement includes actors, stage directors, set designers, decorators, dancers, choreographers, tightrope walkers, fire breathers, clowns and jugglers, sound and lighting technicians, costume makers, film directors and editors, gaffers, cameramen and women, best boys, location managers, dubbers, special effects creators, animation designers and innumerable other professionals: all the people whose job it is to create imaginary worlds. Since 1969, these “intermittents du spectacle” had gained the right to a specific form of unemployment insurance which recognized the inherent discontinuities of artistic practice, and provided a supplemental income to cover the periods when paid labor gives way to volunteer productions, rehearsals, training periods, the quest for inspiration or the search for another contract. But in June of 2003, the agreement governing this form of unemployment insurance was abruptly modified by the French employers’ organization and three minority unions, in an attempt to eliminate roughly 30% of the beneficiaries.2 The intermittents responded with detailed proposals to reform the law, but also with a seemingly endless stream of protest actions, mounting counter-performances all over France, occupying government buildings and interrupting ministerial speeches, creating films, organizing debates, and using their special knowledge to break into national TV programs and take over the mike during live broadcasts. Perhaps the most impressive of these break-ins was the disruption of the reality show “Star Academy,” where the part-time theater workers attacked what is literally a training ground for the professional fetishes of the spectacle society. Around the same time, a much broader social movement was forming: the self-organization of casual or “precarious” labor. The catalyst was a group of Italian activists based in Milan, who called themselves the Chainworkers. Using the simplest of visual and rhetorical tools, they built an iconic language that could reach out simultaneously to kids doing chain-store jobs, temp-service workers, and freelance professionals – the so-called cognitariat, who are sometimes better paid than the others, but face similarly uncertain conditions. To begin organizing they did illegal demonstrations and banner-drops inside shopping malls where all rights to assembly in public are curtailed. Their website, chainworkers.org, was conceived as an information resource and a way to create collective consciousness. But their best tactic proved to be the reinvention of the traditional Mayday demonstration, around the theme of precarious labor conditions. By 2003, the event had already outstripped anything the unions could muster: the next year it brought together 50,000 people in Milan and had spread to Barcelona; in 2005 it took place in twenty different European cities. Conscious of the way that the consumption environments of the postmodern metropolis play constantly on our desires and emotions, the new labor organizers have made Mayday into a subversive fashion parade, where the technicians of the commodity culture use their on-the-job skills to act out an expressive reversal of their ordinary alienation. Instead of opposing the spectacular image, as previous generations did, they aim to pirate it, appropriate it, recreate it on a different basis and for different ends. What’s behind these new protest movements, which take the urban stage as their own living room, or their own multimedia studio? Can these gestures of revolt be situated in a socio-economic context? Writing in the early 1970s on The Urban Question, the sociologist Manuel Castells conceived the city, not as a directly productive machine, but instead as the realm of “collective consumption.”3 The facilities of the city were furnished by the state in order to ensure the reproduction of the working class, according to the needs of capital. For Castells, urban movements demanding improvements and amenities – that is to say, use values – represented a displacement of the basic struggle between the proletariat and the bourgeoisie. Every new housing project, sports field or cultural center was a victory for the oppressed, at a cost that would someday break the backs of the owners. Such a sociological schema seems far away today, when the demands for collective facilities have faded, amidst the rise of mass individualism. The city now appears as a realm where consumption is imposed upon the collectivity. To succeed in doing so, a special environment must be created for the tastes of every target group. The theorist Maurizio Lazzarato has written of the way that corporations “create worlds” to seduce their producers and consumers.4 City councils, development agencies and heritage departments also “create worlds,” in the service of local and international businesses. Urban real estate is conceived as a piece of productive equipment, even, or especially, when it is being used for amusement. The leisure worlds of postmodern cities are very profitable for their owners. But no one dares to say that their consumers – or even worse, their producers – might find them revolting to the taste. Which is also a way of denying that the new movements are truly political. What kind of imaginary worlds do we want to live in? At the outset of the twenty-first century, on a planet at war, one of the rising conflicts in the overdeveloped countries revolves around what some call culture, and others, entertainment. What we begin to see are struggles within what the Situationists termed “the spectacle.”5 At stake are the human creations which make up our everyday environment: the fictional narratives and perceptual stimulations which, like other forms of knowledge, can be conceived either as common goods or as saleable commodities. The theater of the new struggles is the so-called “creative city.” Its managers now propose constant improvements, infinite amenities, in a race to keep up with the theme-parks that are constantly being built in the suburbs. But the stars that are being installed above our heads – with the help of transnational corporations – deserve to be met with an alternative vision, an antagonistic cosmology. It is a matter of bringing the stars back down to human level, of dissolving the commercial mythologies. It is a matter of assembling what Deleuze and Guattari call a “nomadic war machine,” to subversively deconstruct the imaginary environment that transnational state capitalism is constructing.6 What follows are the elements of the struggle to recreate the world-city. The ground of the new urban struggles began to take form some three to four decades ago, in the wake of changes in class composition that first became apparent in the overdeveloped countries in the late 1960s. Mass education was one aspect of these changes, as important fractions of the former working classes gained access to socialized universities. In the early 1970s, Alexander Kluge and Oscar Negt pointed out that research and education formed a major contradiction in the planned economy: because innovation is centrally necessary to a technological society, but it is also rare and largely unpredictable, requiring vast investments in a wide variety of disciplines, without any certain results in the output of each individual student or teacher.7 Thus, all kinds of autonomous investigations could proliferate freely in the state-subsidized educational institutions, independently of any market regulation. Experiments with pure use values, withdrawn from the constraints of monetary exchange, were accompanied by calls for even greater entitlements; and state-funded theorists went so far as to imagine a post-capitalist society. To this development of mass intellectuality must be added what the Italian autonomists have termed “the refusal of work”: a widespread rejection of the alienating conditions of factory labor, ultimately leading to the decline of large-scale, labor-intensive manufacturing processes in the old industrial centers, and to the exodus of workers from the direct control of managerial hierarchies.8 The industrial discipline of the postwar societies began to dissolve into a broad spectrum of radical-democratic demands for emancipation. The conception, and even more, the use of the modern city were gradually altered by this double dynamics of mass intellectuality and the refusal of hierarchical structures. Consider a characteristic formulation of 1960s counter-urbanism: Henri Lefebvre’s The Right to the City, written with the explicit aim to “break up systems,” to undermine rationalized specialization and class segregation. Lefebvre does not see the city as a reproduction machine, a marketplace or decision-making center, but rather as an enduring artwork to be freely appropriated: “The city is itself ‘oeuvre,’ a feature which contrasts with the irreversible tendency towards money and commerce, towards exchange and products. Indeed, the oeuvre is use value and the product is exchange value. The eminent use of the city, that is, of its streets and squares, edifices and monuments, is la Fête (a celebration which consumes unproductively…).”9 Lefebvre envisioned an urban theater of mobile centers, conjured up and dissolved at will by the city-dwellers’ appropriation of their immediate environment. The aesthete will recognize the links to Huizinga’s figure of homo ludens, to the nomadic designs of Constant or Archigram, to the playful, labyrinthine architecture of Aldo van Eyck – while the activist recalls the Situationist dérive and the “constructed situation,” or the revolutionary theatrics of the Provos in Holland and the Diggers in America. All of these interventions sought to open up the modernist city to the “eminent use” of the popular fête. Yet isn’t the urban theme park of today just such a festival environment? What were the consequences of the aesthetic politics of the sixties? To understand how Situationist-type aesthetics combined with a changing class composition to produce a long-term transformation of metropolitan culture, we will need a reference to a very different model of artistic activity in the mid-1960s: Andy Warhol’s “Factory” in New York. Against a backdrop of industrial decay, the artist-impresario opened the doors of an archaic manufacturing building to a gallery of marginal figures – drifters, drug users, transvestites, gays and lesbians, bohemians escaping their class origins – who would experiment with photography, film, television, musical styles (The Velvet Underground), but also with transgressive parties, hedonistic excess. These fringe subjectivities, the exotic detritus of ordinary life, were the “superstars” of the Factory; but only Warhol, with his media aura, could successfully play the role of Hollywood producer and bring them the distribution that they all craved (their “fifteen minutes of fame”). Out of this voluntary blurring of the classes in the post-industrial Factory there emerged two key innovations: the first was a new model of subcultural production, freely translating the energies of social mobility and class conflict into hybrid media commodities; and the second was a new aesthetic of urban inhabitation, based on the gritty attractions of “transitional neighborhoods.” Subcultural production, exploiting all the immediacy of the garage band and the home studio, would become an integral part of the postmodern economy identified by Frederic Jameson;10 while the aesthetics of the urban margins would play a leading role in the speculative renovation of the former industrial areas of modern cities (gentrification).11 This relation between subcultural production and real-estate speculation, which only became obvious in Europe in the 1980s,12 is what has laid the ambiguous ground of today’s urban struggles. How can youth energies be captured, transgressive desires satisfied and egalitarian claims laid to rest, despite the ongoing progress of segregation and homogenization? How can mass intellectuality be captured and channeled, made productive in the cultural-informational economy, without too much political conflict over the content of what is produced? The consensus-building functions of the postmodern economy’s “cultural turn” should never be minimized. The compromise-formation of subcultural production acts to absorb the energies of class mobility, stabilizing them in multimedia proximity to the hard data of the financial sector. Spatially you see similar outcomes: the computer-assisted service industries scattered throughout the renovated manufacturing zones, the edge-city clubs and bar scenes located within prowling range of the glittering business districts. Cultural and subcultural production – of media, fashion, live performance and urban space itself – become important assets for metropolitan rivalry, as cities with global pretensions compete to attract businesses, tourists and talent. Today, the “creative city,” and even the “creative class,” are the buzzwords of urban development.13 Against this background, it is hard to disagree with Eve Chiapello and Luc Boltanski’s contention that the “artistic critique” of the 1960s has furnished a set of values and attitudes that can easily be exploited for the networked business strategies.14 And these strategies in turn become the coveted object of urban governance. The case in point is Barcelona. The ten-year strategic plan for the city’s cultural sector explicitly aims to “strengthen Barcelona as a factory that produces cultural contents,” to “make culture a key element of social cohesion,” to “incorporate Barcelona into the flows of digital culture” and to “project Barcelona as a platform of international promotion.”15 Recognizing the specific characteristics of networked social structure as described by native son Manuel Castells – ironically enough, since Castells had been the prophet of urban struggles in 1970s – the strategic plan of the Catalan capital outlines “a new management model for culture,” based on contractual agreements or “pacts” rather than strictly hierarchical relations between actors, acknowledging the need for autonomy in the development and progressive adaptation of projects to changing situations, and proposing evaluation techniques for the “follow-up” (read: control) “of the cultural pulse of a specific territory (the evolution of cultural practices, the economic dimension of cultural activity, the analysis of the impact of culture in the economic and social context, the analysis of creation, etc. ).” This cultural/economic planning appears as the public-sector equivalent of what is known in business circles as “knowledge management.”16 But can the creative class or “cognitariat” be successfully controlled? And what happens to the subversive dynamics of transgressive mobility and social cooperation? In Europe, the British government has most deliberately developed the planning of pop-cultural production, with an explicit concern for the future of the new labor force that was reflected in the culture ministry’s publication of the “Creative Industries Mapping Document” in 2001. This policy text attempts to delineate a bewildering range of new professions: Arts Promoter, Incubator, Consultancy for Inventor, Cultural Strategist, Multimedia Artist, Visual Support Consultant, Media Initiatives and Relations, Digital Design Consultant, Branding and Communications, New Media Agent, Bio-Entrepreneur (! ), etc.17 The attempt to functionalize the so-called creative industries emerged against the background of the “Young British Art” in the mid-nineties, driven by the advertising magnate Saatchi and accompanied by the media froth generated around the slogan “Cool Britannia” in the years 1996-98, with the publication of the book Creative Britain by Culture Minister Chris Smith in 1998 and Tony Blair’s highly conspicuous flirting with the pop-star milieus – all concurrent with the massification of the Internet and the emergence of so-called “new media.” But the drafting of the mapping document also follows after a long period of high unemployment and casualization of the labor market brought on by two decades of neoliberal policy, as well as a serious recession in the early 1990s which saw a fresh influx of marginal cultural producers to London, to occupy spaces temporarily abandoned by capital.18 The dream of integrating a whole wave of new arrivals to the labor market via highly individualized career-paths articulated around the promise of creative autonomy and the productive tools of the latest technology may now sound rather unlikely, after the krach of the “new economy” and the dramatic rise in social tensions all across the planet in the wake of September 11. Yet the formula of the creative city is still being sold by high-level consultancies 19 to municipal planning departments across the overdeveloped world, with the eager approbation of local and transnational corporations – perpetually obsessed with the rebranding of everything, even the city itself, for global consumption. 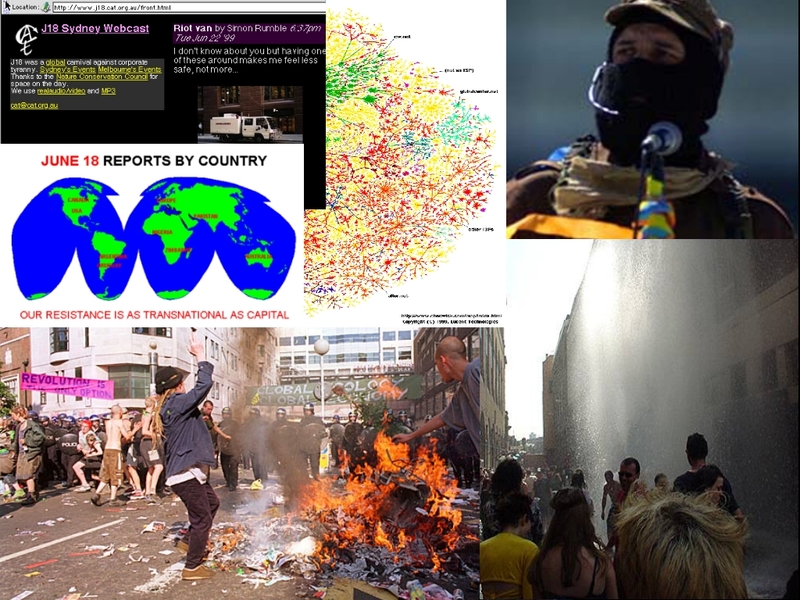 The cycle of antiglobalization protests, launched in the overdeveloped countries by the European wing of the People’s Global Action network in 1998, constituted the first eruption of this “front of total resistance” on the networked urban territory of the world-cities. Marked by a confluence of traditional social movements, single-issue activist groups, disaffected urban youth and rebellious cultural producers – visual and performance artists, musicians, open-air DJs, media freaks and computer hackers – these demonstrations often take the form of politically oriented techno-parties, no longer simply eluding police repression, but using all the resources of cooperative cultural production to actively target the sites and symbols of corporate control over intimate consciousness and public expression.22 If Seattle brought this front of resistance to a higher level, it was not only because of the greater complexity of the social movements involved, nor only because of the direct influence that the movement could now claim over decision-making at the summit. It was also because of the intensity of the urban battle, sparked off by disciplined affinity groups using sophisticated techniques of civil disobedience, and pursued by anarchist “Black Blocs” and untold numbers of city-dwellers revolted by the violence of what one analyst called a “police riot.”23 A Niketown sales outlet, epitomizing the exploitation of distant labor, the cooptation of subcultural creativity and the transformation of the city into a corporate theme-park, was deliberately attacked and destroyed, giving rise in the process both to a transnational urban legend and to a complex form of solidarity between the social classes. Similar demonstrations took place in Washington D.C., Sydney, Prague, Nice, Seoul, Quebec City, Barcelona, Göteburg and other metropolitan centers, accompanied by the development of the Indymedia network and a process of intensive translocal exchange. For many in Europe, the movement came to a head in July of 2001 in Genoa, with a police riot on the scale of the one in Seattle and the murder of a protestor, Carlo Giuliani, followed soon after by the paralyzing shock of September 11. But a giant step further was taken in the highly developed but peripheral country of Argentina, where a currency crisis brought about an alliance between unemployed workers and the middle class, toppling the government with massive demonstrations on December 19 and 20, 2001, and opening a year-long period of radical social experimentation. The struggle over the definition of social services, scientific research, cultural production and the natural and built environments either as private commodities or as common goods under some form of collective stewardship has become one of the central conflicts of our time, disputed on a territory that extends from intimate subjectivities to the networked spaces of politics.31 Given the manipulability of public opinion in the contemporary media democracies, the destinies of this struggle will depend crucially on people’s ability to recognize and resist the new techniques of social management. In this regard, some interesting news has come from one of the premier “creative cities,” Barcelona. Spurred on by the successful instrumentalization of the Olympic Games in 1992, construction and real-estate interests again joined hands with the city government in the mid-1990s to plan an urban infotainment project: “Forum 2004,” also known as the “Universal Forum of Cultures.” Held in a vast new seaside facility built right next to the poorest district in the metropolitan region (but without any particular benefit for that district), this 3 billion-euro project could act not only as a tourist magnet and an immense source of revenue for construction companies, but also as a simulacrum of the contemporary Social Forum movement, conducted under the direct control of the municipality and its corporate backers. Thus the manufacture of consensus is revealed as the primary postmodern industry: “The Forum does not claim to maintain an equal distance between Davos and Puerto Alegre, but to be the meeting place of the two poles, an exercise of dialogue between opposites,” wrote the director of the event.32 But what does such a meeting lead to in reality? 1. For information on the movement, see <www.stopub.tk> and André Gattolin, Thierry Lefebvre, “Stopub: analyse provisoire d’un rhizome activiste,” in Multitudes 16 (Spring 2004), available at: <http://multitudes.samizdat.net/article.php3?id_article=1376&gt;. 2. Cf. <http://cip-idf.ouvaton.org&gt;, as well as Multitudes 17, dossier on “L’intermittence dans tous ses états” (Summer 2004). 3. See The Urban Question: A Marxist Approach (Cambridge, Mass. : MIT, 1977; 1st ed. 1972). 4. Maurizio Lazzarato, Les révolutions du capitalisme (Paris: Les Empêcheurs de penser en rond, 2004), chap. 3; an initial version of this argument can be found in “Créer des mondes,” Multitudes 15 (Winter 2004), at <http://multitudes.samizdat.net/article.php3?id_article=1285&gt;. 5. With respect to the strike of the intermittants, Jean Baudrillard speaks of a “just revenge against the spectacle – by the spectacle-makers themselves.” In “Les Suicidés du spectacle,” Libération, July 16, 2003, archived at: <http://library.nothingness.org/articles/SI/fr/display/370&gt;. 6. Gilles Deleuze, Félix Guattari, “Treatise on Nomadology – The War Machine” in A Thousand Plateaus: Capitalism and Schizophrenia (U. Minn. Press, 1987; 1st ed. 1980). 7. Alexander Kluge, Oscar Negt, Public Sphere and Experience (U. Minn. Press, 1993; 1st ed. 1972). 8. Antonio Negri, Marx Beyond Marx (New York: Autonomedia, 1991; 1st ed. 1979); also see Negri’s essay in Des entreprises pas comme les autres: Benetton en Italie et Le Sentier à Paris (Publisud, 1993). 9. Henri Lefebvre, “The Right to the City,” in Writings on Cities (Oxford: Blackwell, 1996; 1st ed. 1968). 10. Frederic Jameson, Postmodernism, or, The Cultural Logic of Late Capitalism (Verso, 1991; original article 1984), at: <http://xroads.virginia.edu/~DRBR/JAMESON/jameson.html&gt;. 11. Sharon Zukin, Loft Living: Culture and Capital in Urban Change (Rutgers University Press, New Brunswick N.J.: 1989; 1st ed. 1982). 12. For a case study of urban transformation and subculture politics in the 1980s, Christian Schmid, “The Dialectics of Urbanisation in Zurich,” in INURA (eds. ), Possible Urban Worlds (Basel: Birkhäuser Verlag, 1998). 13. Charles Landry, The Creative City (London: Earthscan, 2000); Richard Florida, The Rise of the Creative Class (New York: Basic Books, 2002); Paul Ray, Sherry Anderson, The Cultural Creatives (New York: Three Rivers Press, 2000). 14. Luc Boltanski, Eve Chiapello, Le Nouvel esprit du capitalisme (Paris: Gallimard, 1999); English summary at: < http://www.sociologia.unimib.it/mastersqs/rivi/boltan.pdf>. 15. “Strategic Plan of the Cultural Sector of Barcelona,” at: <www.bcn.es/accentcultura/angl>. 16. For an example of the knowledge-management business, see <www.debonothinkingsystems.com>. 17. Department for Culture, Media and Sport, “Creative Industries Mapping Document,” at: <www.culture.gov.uk/global/publications/archive_2001/ci_mapping_doc_2001.htm>; cf. Angela McRobbie, “‘Everyone is Creative,'” at: <www.k3000.ch/becreative/texts/text_5.html>. 18. Emma Dexter, “Picturing the City,” in Century City: Art and Culture in the Modern Metropolis, exhib. cat., Tate Modern, London, Feb. 1 – April 29, 2001; Julian Stallabrass, High Art Lite (London: Verso, 1999). 19. Cf. the list of consultancies in Creative Cities, op. cit. 20. Cf. Philippe Zarifian, “Les sociétés de contrôle,” in A quoi sert le travail? (Paris: La Dispute, 2003), as well as Brian Holmes, “The Flexible Personality,” at <www.u-tangente.org>. 21. Interview with André Gorz, “Economie de la connaissance, exploitation des savoirs,” in Multitudes 15 (Winter 2004). 22. Cf. “Friday June 18th 1999,” in Do or Die 8, at:<www.eco-action.org/dod/no8/j18.html>. 23. Cf. Paul de Armond, “Netwar in the Emerald City,” at: <http://nwcitizen.com/publicgood/reports/wto&gt;. 25. Harry Cleaver, “Computer-linked Social Movements and the Global Threat to Capitalism,” <http://www.eco.utexas.edu/homepages/faculty/Cleaver/polnet.html&gt;. 26. For an idea of the class composition, cf. Notes from Nowhere collective (eds. ), We Are Everywhere: The Irresistible Rise of Global Anticapitalism (London: Verso, 2003). 27. “Nike Ground – Rethinking Space,” at: <www.nikeground.com>. 28. 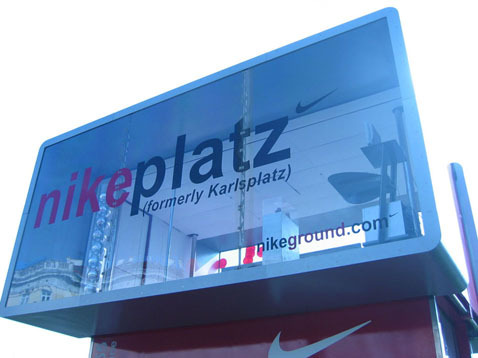 “Nike Buys Streets and Squares,” at: <http://0100101110101101.ORG/home/nikeground/story.html&gt;. 29. Mike Perry, Nasko Oskov, Introduction to Reverse Engineering Software, at: <www.acm.uiuc.edu/sigmil/RevEng/index.html>. 30. Bureau d’Etudes, “Autonomous Knowledge and Power in a Society without Affects,” at: <http://utangente.free.fr/anewpages/holmes.html&gt;. 31. On common goods, cf. Philippe Aigrain, “Pick the Right Modernity,” at <www.sopinspace.com/~aigrain/modernity.pdf> (in French at <www.sopinspace.com/~aigrain/bienscommuns.pdf>). 32. “El Fòrum quiere ser el punto de encuentro de Davos con Porto Alegre,” in El País, supplement “Cultura,” Jan. 25, 2004. 33. “Los grupos críticos con el 2004 reúnen mil personas en el Ateneu,” in La Vanguardia, Jan. 22, 2004. 35. See <www.sindominio.net/mapas>. The collective included members from Conservas, Rotorr, Asamblea de Insumisos, Boicot preventiu, Espai en blanc, Infoespai, Miles de Viviendas, and others. This entry was posted on January 29, 2004 at 11:25 pm and is filed under 1. You can follow any responses to this entry through the RSS 2.0 feed. You can leave a response, or trackback from your own site.